A simple and addictive puzzle game for the mind. 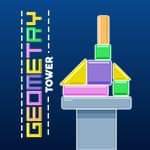 Construct the highest tower in history in game Greometry Tower. For task in view achievement it is necessary to make geometrical figures as much as possible steadily, keeping balance. On road upwards it is necessary to collect bonus stars.